The idea of posting this has been simmering in my mind all day. It started when I saw an op ed piece in today’s Globe – and this infographic which is somewhat older. In an end-of-year interview, Mayor Rob Ford made it clear that his transit priority is extending the Sheppard subway line. It’s not a crazy idea. The question is whether it represents the best bang for the transit buck. Given the amount of discussion here on a similar issue – the next rapid transit extension in this region and the choice of technology – I think this is a good comparison. Marcus Gee also makes the main point. 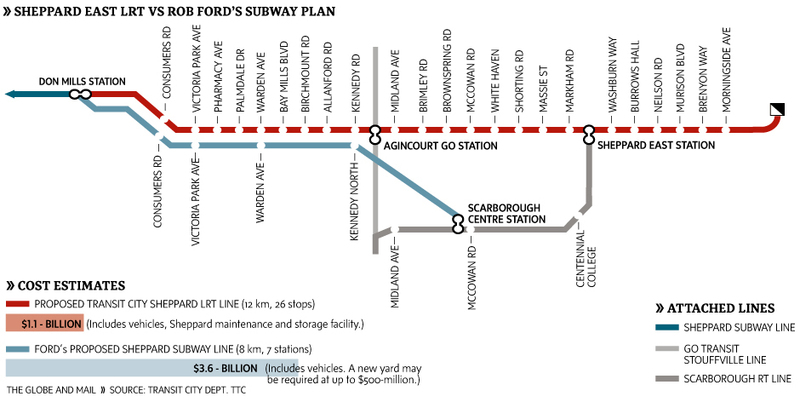 The reason Ford wants subways, not surface LRT, is that it keeps the the transit away from the cars. Ford thinks that the existing streetcar system is the cause of congestion in Toronto. What he doesn’t want to consider is that people in cars waste huge amounts of resources to get where they want to go: perhaps the most significant from the point of view of this debate is street space at peak periods. The most that a ~3m wide strip of road (i.e. one lane) can move is 1,000 vehicles per hour (2,000 if its a freeway: it’s the intersections that cause the difference). At average 1.3 persons per vehicle occupancy that means 1,300 persons per hour per direction. Rapid transit can easily move ten times that number without any grade separation. And at the sort of densities that most North American urban regions are built to, that’s plenty for most applications. And far more than are currently being moved on the Sheppard subway. It is also important to note that rapid transit is only part of the issue. It is more important that we build urban areas to reduce the need for motorised transportation. The Transit City plan was part of a much bigger idea – that land use density along transit corridors should be increased. This would have been a major change in Toronto. After the Yonge Street line was built, with towers popping up near the stations, the Bloor Street line only got built once the neighbourhoood activists were satisfied that no land use change would be permitted along the line. Again, almost the same outcome as seen in east Vancouver along the Expo line with the one exception of Joyce-Collingwood. “Denser development” did not mean high rises at widely spaced stations, but mid rise (four storeys or so) along the arterials – as we already see on parts of Broadway – and even 4th Avenue. This kind of area also means mixed land use (retail underneath apartments for instance) and produces a lot more walk and cycle trips. a sports jock in a florid pink jacket is the star of a mayoral inauguration in Canada’s largest city. Thanks to Don Cherry’s boisterous performance, there’s now a new standard of civility at Toronto City Hall. Why do some sports jocks hate cyclists? Cherry’s bon mots not only branded the Rob Ford mayoralty but also doubtless gave licence to radio-ranters across this land looking to source civic politics for some testosterone-filled rhetoric. Sports talk is one of the permitted places in Canadian media where Fox-style hyperbole plays well. Since American role models from Rush Limbaugh and Glenn Beck have refined the scripts on how to fight the culture wars (first, target something vulnerable – oh look, cyclists), these dudes are ready for their cue. The Cherry performance brought trash talk into city hall as the new rhetoric. Characterizing an entire community as left-wing kooks polarizes the debate Fox-style. The old left – right paradigm in politics is increasingly irrelevant. What matters now is the difference between the ‘business as usual’ crowd (which includes the large union dominated NDP as well as the business friendly parties) and those who see the need for our civilization to change direction, avoid imminent collapse, and start thinking about how to survive on a rapidly heating planet. We are past peak oil which means not only that we cannot afford to operate internal combustion engined vehicles for every trip, we will also have huge challenges in building replacement technologies. Even if switching to electric cars could be considered, we do not have the resources available to achieve that. Nor would it resolve any of the problems we are now facing. The choice of rapid transit technology is not just one of cost – though that ought to register even in a mind as befuddled as Ford’s. It is also very much about what sort of planet we can hope to inhabit in the future. What worries me is that we keep on voting for people like Ford – and cheering on Don Cherry. Other bloggers (like Michael Geller) are doing year end summaries, or sending out “gifts”. Rob Cottingham has produced a neat print it yourself calendar – which includes two transit themed images. Can I blog one of your cartoons? Yes, and thanks for asking! You can use the car­toons without charge in blog posts under a Creative Commons Non-Commercial Attribution license (be sure to credit me and link back to the cartoon’s original page here). (I lifted the cartoon from the pdf file – and he doesn’t want bloggers to link to that directly. I used my Mac shortcut to copy it and GIMP to rotate it as the cartoons are tilted in the calendar. So I suppose I did get creative, if not very geekily). Rob was kind enough to contact me and provide a link to “a crisper version”. This, by the way, should NOT be taken as any indication that I am unhappy with the life I am now living. In fact 2010 was very good to me indeed – and I trust that you may have a New Year as good for you as this one was for me. The report was released last week. I missed the press release – and, so far as I am aware, it got little coverage. A Google News search just found one piece in the Chilliwack Times. That’s probably because it has no surprises, and says nothing very much of any significance. Except that we cannot apparently afford transit – and especially not rail transit. We can afford lots more roads, of course. The BC Ministry of Roads, Highways and Urban Sprawl can always find more to keep on doing what it has always done. This should not be read as an attack on John Steiner – the consultant who wrote the report. He has done a good job but also been very careful to fit his findings to suit the desires of his clients. That’s what consultants do if they want to stay in business. Even so, there are some pretty damning findings. 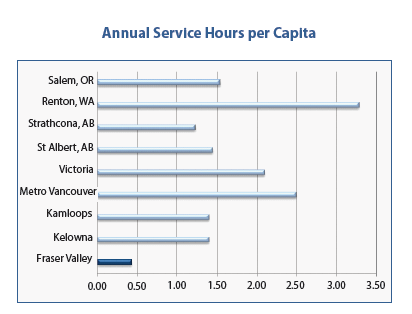 Although not a definitive indicator of attractive transit, the Fraser Valley receives less than 0.5 service hours per capita. All other communities that have higher transit mode shares have two to five times the service hours per capita, indicating a possible link between transit capacity and the propensity of people to take transit. 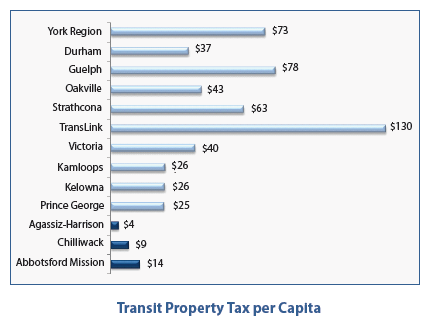 Fraser Valley residents spend anywhere from $4 to $14 annually per capita on transit in the form of a property tax. This amount is less than levels of other mid-size communities in BC, and is significantly below levels of other large municipalities in Canada where provincial funding is not provided and property taxes. The politicians of the Valley share a value system that likes what they have and wishes to protect it – indeed that is what is meant by “conservative”. It does not means that they are opposed to change – it just means that they want to see things continue they way they are. In this mind set they are not doing anything wrong. Not spending on transit keeps property taxes low, which is a popular thing to do. The report does clearly suggest that this approach needs to change, but not by very much. It is “made in Fraser Valley” strategy, which means anyone who suggests that an alternate approach needs to be examined is an outsider. Other than continued economic and population growth there is no sense that the world around the Fraser Valley is changing. managing this growth and fostering the sustainability of these communities is essential particularly in the area of reducing automobile dependence and increasing travel options. The FVRD’s Regional Growth Strategy (RGS) demonstrates a commitment to ‘Increase Transportation Choice and Efficiency,’ which includes reducing dependency on single-occupant vehicle travel and enhancing commitments toward the provision of attractive bicycle and pedestrian facilities, as well as a broader range of transit services. The Provincial Climate Action Plan and Provincial Transit Plan recognize the need for creating attractive transit services in growth areas in order to support more sustainable land use patterns, to provide attractive transportation alternatives and to reduce greenhouse gas emissions. Except that these commitments are just camouflage. The province’s commitment to greenhouse gas reduction includes the huge expansion of oil and gas exploration, the growth of coal exports, the widening of the freeways and the building of new ones. There is a small carbon tax – but even that may well be sacrificed in the name of competitiveness, depending on who the BC Liberals choose for their next leader. Not that it has had the slightest impact on carbon output. The freeway widening is all within Metro – so the Valley can, apparently ignore that. Except that it does extend right up to their boundary and is going to induce a great deal more car traffic. And will also encourage a lot more car dependent development. The failure of this strategy – and of this government – is the firm commitment to business as usual. It is part and parcel of the mindset that sees the economy as the only indicator that matters – and especially the ability of the large corporations to increase their profitability. These corporations have funded the raft of right wing “think tanks” that espouse free markets, and cast doubt on any other approach – or set of values. The idea that we can actually take charge of our communities, and design them to produce a better quality of life and a truly sustainable future for ourselves and our descendants is always readily dismissed as pinko fulminations. The intentions of the government were never in doubt. It is sad to see that so much energy and effort has gone into squashing all thought of a change of direction. A few small token gestures can now be expected, but the mode share of transit at 1% is not likely to change by very much any time soon. And that suits most of the electorate, and the people they elected. It will not of course bring about any of the outcomes that this report identifies as necessary. And you can bet that when this becomes apparent there will be lots of finger pointing and blaming others. The province will say that property taxes had to be raised but local politicians were unwilling to step up to the plate – just as they are in Metro, where the figures are different but the policy the same. The land use will continue to be low density, fringe additions – with lots of free parking. That may not be what the regional strategy or the OCPs appear to say, but that is what will happen when municipal decisions are made. And the railway tracks, where the public right to operate passenger train service persists, will continue to see increasingly rare way freights for most of their length. The freeway will quickly plug up once again with induced traffic and people sitting in the smog will wonder once again why doing the same thing over and over again does not produce a different outcome. I have covered the BC Rail mess here at length. Yesterday Alex G Tsakumis started releasing – one a day – the notes that Dave Basi kept as “memos to file” in the period from October 6, 2003 to November 25, 2003. Basi states that he was instructed to keep the other bidders in the process once it became clear that CN had an inside track. Tsakumis points the finger at Christy Clark and states that she is “unfit to hold public office”. Tsakumis also berates the press for giving the BC Liberals an easy ride, and not calling for a public enquiry. 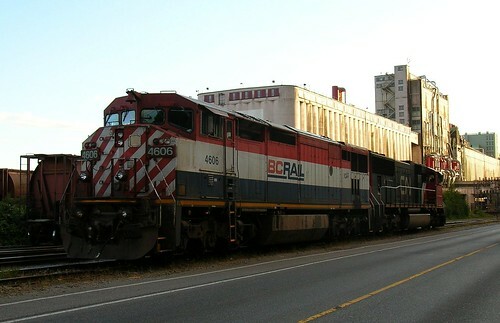 On the same topic but a different source, the Globe and Mail is reporting that Basi and Virk were, allegedly, paid long before the BC Rail deal by Erik Bornman, a director of Pilothouse Public Affairs.